I have a confession to make. I don't always buy organic produce. In fact I usually don't. It's not because I think organic isn't worth it. I love organic. I really really want to buy organic. We can't afford it right now. Washing also cleanses your food of waxes and bacteria. Think about how many hands come into contact with your fruits and vegetable before they get to you! Unfortunately a quick rinse in the sink won't due. Pesticides are made to withstand the rain so your going to need more than just plain water to break them down. You can try the many produce washes sold at the grocery store. But it's easy to make one yourself from ingredients you probably already have on hand. Combine all the ingredients together in a large bowl. The baking soda and vinegar will react when you mix them together so make sure there is plenty of room in your bowl for the resulting foam. Transfer mixture to a spray bottle. To use spray on produce and let sit for 5 minutes. Scrub for at least 30 seconds. Use a veggie scrub brush if the produce can withstand it. Rinse in running water. For very delicate foods like berries you can skip the scrubbing. Just rinse in a colander after the solution has set for 5 minutes. 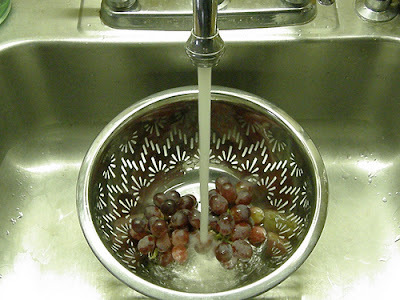 To avoid early spoilage wash produce just before use. Does the vinegar change the taste of the produce? yeah, that was my question. does the vinegar change the taste? I've never noticed any taste from the vinegar. Rinse well and it all comes right off. I assume this lasts for a while in the bottle? thanks, simone. I've never noticed it going bad on me. It takes me about a month to use it up. I don't think any bacteria could survive with all the vinegar. That's just from my experience and my best guess though. It has actually never occurred to me that it could go bad. Great question! Do you use this rinse on leafy greens (lettuce, spinach, etc. ), as well? Normally I try to buy those as organic, but no matter what sort I buy, I just soak them in water for a few minutes and then rinse a few times and drain them in a salad spinner. I'm trying to imagine how this would work with such vegetables. I lay the greens out on a paper towel and spray them. After they have set 5 minutes I will gently rinse them in a colander. Thanks! Very good suggestion you made for a blended coffee drink here, by the way. I'm looking forward to trying that, too! Kurt- I hope you like the coffee drink. I think it's so good I have to stop myself from making it everyday! When you say "1/2 lemon", does that mean the "juice of 1/2 lemon"? Thank you for sharing. I have a 15 month old toddler and is currently pregnant. So we are trying to be as conscious about what we ingest within reason (budget). It's good to know that I can clean the fruits/vegetables we eat (especially when it's salad form). I was curious about the 1/2 of lemon as well. Is that the juice of 1/2 a lemon??? I have a Blendtec and can pulverize the entire lemon. Just curious if there are any antibacterial properties in the rind of the fruit as well. Other veggie washes I have used from the grocery store I have added to water to wash leafy greens and berries. Have you done that with this mixture too or would it dilute it too much?? Thank you for all your insightful knowledge. You understand a whole lot its almost tough to argue with you (not that I really will need to? HaHa). You certainly put a new spin on a subject that's been discussed for ages. Wonderful stuff, just great! post is just spectacular and i can assume you're an expert on this subject. Fine with your permission let me to grab your feed to keep updated with forthcoming post. Thanks a million and please continue the rewarding work. Hello, yup this piece of writing is truly fastidious and I have learned lot of things from it concerning blogging. Any way I will be subscribing on your augment or even I fulfillment you get admission to persistently fast. Hey I found this web site to be actually fascinating! and can certainly work. Still, the posts are very short for newbies. I'm gone to convey my little brother, that he should also pay a visit this webpage on regular basis to get updated from hottest reports. I don't drop a bunch of remarks, but after reading a ton of responses on this page "How To Wash Your Produce and Remove Pesticides". I do have a few questions for you if it's allright. Is it only me or does it look as if like some of these remarks come across as if they are coming from brain dead people? :-P And, if you are posting on additional sites, I'd like to keep up with everything new you have to post. Would you make a list of every one of all your public sites like your twitter feed, Facebook page or linkedin profile? Great blog you have here.. It's hard to find good quality writing like yours nowadays. I seriously appreciate individuals like you! Take care!! Good site you have got here.. It's difficult to find high-quality writing like yours these days. I truly appreciate people like you! Take care!! You would get the key ingredients which allows to reduce the stretch marks by following the link is placed here.... stretch mark removal in an effective way. Of course the baking soda and vinegar will react! And will CANCEL EACH OTHER producing carbon dioxide and sodium acetate. How come so many sites have this? عزيزى العميل اذا كنت فى اى مكان فى المملكه العربيه السعودية وتبحث عن افضل الخدمات المميزة فعليك ان تتصل وتتواصل بينا على الفور فى القيام باعمال المكافحة والقضاء على الحشرات فاستعن بينا على الفور فى القيام بكل ذلك شركة رش مبيدات بالخرج . Facebook lacks an uncertainty wordpress.com/ the best as well as one of Official Website the most common long array social networking website in the world.4Liker App All Version Free Download For Android, iPhone, PC There are over a billion vibrant individual 4Liker App and is an extraordinary phase to draw in 4Liker prospective facebook users. Lightweight, folds up little, as well blogrip.com/ as can be thrown through a clean cycle.Website Material high chairs are excellent for Best High Chairs and Booster Seats feeding your child while you take a trip.